I will not say it. I won't repeat the old saying about apples, the one that EVERY article about apples quotes. But you know what it is. And believe me, it's not said for nothing. A member of the rose family, the apple is packed with great nutritive properties. Peoples of ancient cultures even knew that. Following are some of the benefits of the Forbidden Fruit of Paradise. Apples are good for the digestive system for a number of reasons. First of all, one of the easiest foods the stomach can digest is a ripe raw apple (digestion of an apple is said to be completed in eighty-five minutes). 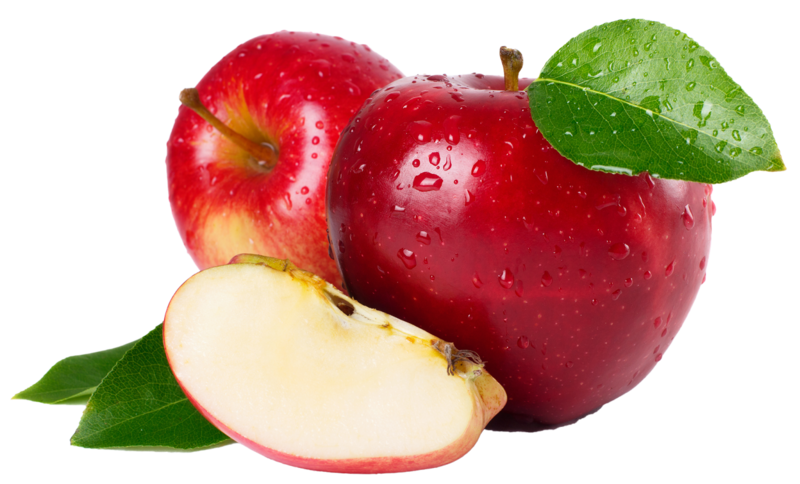 Apples contain malic and tartaric acids, which are what make apples so digestible. These acids also neutralize the acid products of indigestion by changing into alkaline carbonates, providing relief from upset stomach symptoms. Furthermore, the acids help the stomach digest other foods. The custom of eating applesauce with pork goes way back in time, when people had to make a difficult-to-digest product digestible. In fact, the oldest known recipe for apples appears in a book written by Apicius in the 1st century A.D., De Re Coquinaria (On Cookery): "Diced Pork and Matian Apples." Apples relieve both constipation (by softening the stool) and diarrhea. As a by-product, they benefit the liver, as well. Eat apples regularly, particularly after a meal, to maintain normal bowel function. To relieve diarrhea, eat 1 or 2 apples, peeled and grated. To relieve constipation, eat apples stewed, or dry the peel of a whole apple, simmer it in water, and drink it warm. Or, eat a ripe, juicy apple (especially a sour one) just before bedtime every night. —Lower blood cholesterol. Pectin is largely responsible for this (although it might also produce gas). —Prevent certain types of cancer. —Regulate blood sugar in people with diabetes and may offer protection from adult-onset diabetes. Research indicates that increasing fiber may decrease the body's need for insulin. —Protect against heart disease and treat existing heart disease. —Relieve constipation. —Fight colon and other gastrointestinal cancers by speeding food through the digestive tract. Apples have benefits specific to women. Apples contain boron (2 apples have 1 mg boron). Boron helps fight osteoporosis by preventing calcium loss and bone demineralization. It also raises estrogen levels, which then reduces PMS symptoms. Another benefit of boron is that it enhances brain activity and increases mental capacity. —Apples contain phytochemicals, particularly quercetin, ellagic acid, and caffeic acid—important cancer-fighting agents. On-going research is linking apples (specifically, its quercetin) to lower incidences of lung cancer. Apples can reduce the risk of it by as much as half. A study reported that of 9,959 patients, those who ate a lot of apples were less likely to develop lung cancer than those who ate fewer apples. —Apples have a "filling" effect and help reduce appetite. —The sugar in a sweet apple readily passes into the blood stream, resulting in an energy boost and increased warmth. —Apples may help induce sleep. —Because apples are firm and crunchy (when fresh), they act as dental cleansers. They push back the gums, allowing plaque to be cleaned away. Its juices help cleanse teeth, too. —Recent French studies have shown that the bacteria that cause typhoid fever cannot live long in apple juice. It is possible that water whose quality is questionable can be rendered safe by mixing it with apple cider. —They have mild antibacterial, antiviral, and anti-inflammatory properties. Cooked apples can be used topically to help heal sore throats and skin inflammations caused by erysipelas. Crushed apple leaves help prevent infection in a fresh wound. —Studies on dropsy (edema) found that horseradish steeped in apple cider helped reduce symptoms. —Apples are a traditional remedy for rheumatism. —Apple juice was one of the earliest known remedies for depression. Most of an apple—about 84%—is made up of water. One medium apple contains: 80 calories; 0.3 g protein; 0.8 g fat; 20 g carbohydrates; 10 mg calcium; 14 mg phosphorus; 0.4 mg iron; 1 mg sodium; 152 mg potassium; 120 IU vitamin A; 0.04 mg thiamin; 0.03 mg riboflavin; 0.1 mg niacin; 6 mg ascorbic acid; 4 g dietary fiber. Apples also contain more phosphates than any other produce. Is it any wonder that apples were associated in Greek mythology with immortality? Most of the nutrients in an apple exist just below the skin. Much of the fiber is in the skin and core. Therefore, apples are best eaten unpeeled. It is heartening to know that 55% of the 1998 U.S. apple crop was sold as fresh fruit (as opposed to being processed). Always wash the skin well with soap and warm water to remove pesticides and other chemicals. Applesauce can be used (measure for measure) as a fat-free substitute for oil in baked goods, such as cakes and muffins. When buying apples, pick ones that have no bruises and that are firm. Apples with wrinkled skin, brown spots, or that are soft should be avoided. Store apples away from other produce; they emit ethylene gas, which causes other produce to deteriorate quickly. Apples will last longer in the refrigerator. They also absorb odors easily, so store them away from strong-smelling foods. If you are slicing apples, squirting them with a little lemon juice will keep them from turning brown. For more information on apples and great recipes, visit Washington Apple Commission at http://www.bestapples.com and U.S. Apple Association at http://www.usapple.org. Enjoy the apple recipes below. Wipe and cut apples in four, remove bad parts. Place in preserving pan with lemon, well cover with water. Boil to a pulp. Place in a bag, allow to drip into a clean basin all night. Return to pan, adding 1 lb. sugar to each pint of juice. Boil for 3/4 hour or until jelly will set. Pour into clean, dry, warm jar. Tie down at once. Preheat the oven to 400 degrees. Halve the squash lengthwise with a sharp knife and scoop out the seeds and fibers. Place cut side up in a shallow baking dish and cover tightly with foil. Bake for 45 to 50 minutes, or until tender. Set aside until cool enough to handle. Heat the oil in a soup pot. Add the onion and sauté over medium-low heat until golden, about 8 to 10 minutes. Add the apple dice, water, bouillon cube, and spices. Bring to a simmer, then simmer gently, covered, until the apples are soft, about 10 minutes. In a food processor, puree the squash with 1/2 cup of the milk or soymilk until completely smooth. Transfer to a bowl. Transfer the apple-onion mixture to the food processor and puree until completely smooth. Transfer both this and the squash puree back into the soup pot and stir together. Add the remaining milk or soy milk, using a bit more if the puree is too thick. Bring the soup to a simmer once again, then cook over low heat for another 5 to 10 minutes, or until well heated through. Season to taste with salt and white pepper. Serve at once, or let the soup stand off the heat for an hour or two, then heat through as needed before serving. Preheat oven to 350°. Combine first 4 ingredients in a small bowl. Core apples three-fourths of the way through. (Do not cut through bottom.) Peel top half of each apple. Fill apples with cherry mixture. 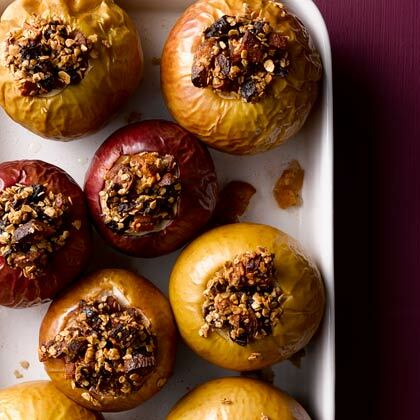 Place apples in a 12-inch cast-iron or heavy ovenproof skillet. Add the juice to skillet. Combine maple syrup and butter; pour over apples. Cover; bake at 350° for 40 minutes. Uncover; baste apples with juices from pan. Bake, uncovered, an additional 25 minutes or until tender. Serve with sauce. Yield: 8 servings (serving size: 1 apple and 2 tablespoons sauce). Note: Apples can also be baked in a 13 x 9-inch baking dish.